If you’re looking for a timeless ring, a round cut diamond is for you. Round cut diamonds are the most popular to date, cornering nearly 75% of the diamond market. But just because it's the most popular doesn't mean that it's not unique. You can add a pop of color or a customized halo this diamond to make it unique to you. These diamonds are stable in shape and are generally considered to be one of the least likely diamond cuts to fall out of a setting, making it able to be featured in lots of different settings. And because the diamond is fully curved, it gives off the most light of any diamond cut out there. Whether you're looking for a classic solitaire or a pavé halo style, a round-cut diamond ring will be stunning no matter the design. 1. What Is A Round Diamond Ring? A round diamond ring is a ring in which the main stone is in the shape of a circle, or a grouping of smaller stones makes a circular shape. 2. What Is The GIA? The GIA is an independent, nonprofit organization that conducts gem research, educates gem professionals and sets the standards for determining diamond quality. One of GIA’s main functions is the grading of diamonds. The GIA created the 4Cs of diamond quality: color, clarity, cut and carat weight, along with the scientific procedures for evaluating each “C” and the grading terminology used to describe them. The GIA does not mine diamonds, nor does it buy, sell, or trade them commercially. It doesn’t appraise diamonds and is not otherwise involved in diamond pricing or valuation. GIA operates independently of these commercial interests, ensuring that its diamond quality assessments are objective and unbiased. 3. What Is A GIA Certified Diamond? The GIA doesn’t actually certify diamonds; it grades them. The terms “GIA certified” and “GIA cert” are commonly used in the jewelry industry to refer to diamonds that have undergone GIA’s rigorous grading process and to the reports that accompany the diamonds. The GIA itself does not use the word “certificate” to describe the document it issues. 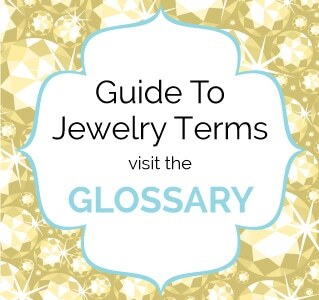 The GIA examines the diamond, assesses its qualities based on the 4Cs, and describes it. It does not certify the diamond or its value. These rings can be purchased at any jeweler, and they can also be purchased online. These rings can range in price from $200 to upwards of $5000. 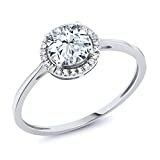 The round diamond rings on this list were reviewed based on their features, pros & cons, price, and availability. It is important to us that our readers feel confident in the information we give them in our reviews. 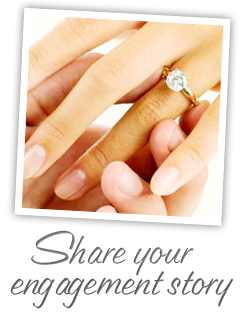 To be sure we are giving you quality and accurate information, we have held each diamond ring to the same standards, so it is an even playing field. 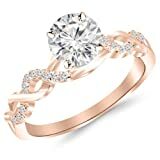 The round diamond rings we reviewed below range in price from around $200 to about $2300. 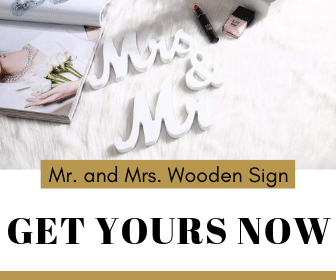 The less expensive rings on this list are beautiful rings and meet all of our review standards. 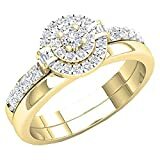 However, the more expensive rings may be of better quality diamonds or gemstones and may have an overall better appearance than the less expensive rings. MADE OF REAL SOLID GENUINE 10K WHITE GOLD - This Ring is made of solid 10K White Gold, with 10k Stamp. This composition makes this ring extremely tough making it suitable for everyday use. Every piece passes rigorous inspection. So you can buy with confidence. This simple ring has an elegance about it. The sapphires are a great accent color if this ring is for someone who loves the color blue, or it can even be the “something blue” a bride wears on her wedding day. This ring contains a total combined carat weight of 1/10 carat. The diamonds are rated I-J for color, and I2-I3 for clarity. If you’re looking for an affordable ring that still has a lot of class, this is it. This ring has a band of 14k gold but keeps costs low by using cubic zirconia instead of diamonds. Cubic zirconia is like a diamond with its brilliance and crystal clarity, but it is a man-made material that is colorless, hard, and flawless. It looks so much like a diamond; it is an affordable alternative to them. A large center stone, paired with a halo of stones and more stones on the band, gives this piece a lot of shine. IGI-certified jewelry has been assessed and authenticated by the International Gemological Institute's expert gemologists. This three stone ring features round cut diamonds encircled by pave-set halos. The band is made of 14k gold and has split shoulders that are embellished with small round diamonds. It is certified by the International Gemological Institute which is similar to a GIA certification and is made of conflict-free diamonds. Victorian rings are styled after ring designs that were around during Queen Victoria’s reign. Because her reign lasted almost 64 years, rings in the Victorian style can take a variety of forms. This ring is in a more ornate Victorian style, but it has a ton of sparkle. The 1-carat center stone is surrounded by spectacular white gold filigree with smaller round diamond set into the 14k white gold band. The band is also ornately designed with designs along the outer edges. This unique infinity diamond setting has a twisted band that contains 0.51 carats of pave set diamonds. The center stone is a large moissanite stone. Moissanite is a rare mineral, discovered by the French chemist Henri Moissan in 1893. This ring is more affordable than a similar style with all diamonds. This ring is available in rose, yellow, or white gold. It’s also possible to get this ring with a platinum band. The twisted band and use of pavé diamonds give this piece a lot of movement. If you pick out a unique engagement ring, it can be tricky to find a wedding band that meshes with the design of the engagement ring. For that reason, it is useful to buy an engagement ring that’s already paired with a wedding band. This ring showcases a stunning 0.45 carats prong set round white diamond that sparkles at the center. A double round-shaped frame set with shimmering round accent diamonds wraps this center stone in eight baguette cut diamonds that flank the center stone, while additional diamonds line the split shank. The coordinating diamond wedding band was designed to fit beneath the engagement ring completing this eye-catching ensemble. 30 Round Diamond & 1 Treated Black Round Diamond set using Prong Setting. Gemstones may have been Treated to Improve their Appearance or Durability & may Require Special Care. The Natural Properties & Composition of Mined Gemstones define the Unique Beauty of each Piece. The Image may show Slight Differences to the Actual Stone in Color & Texture. 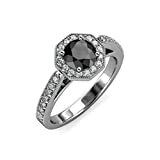 Black diamonds are a great alternative to clear diamonds. This halo engagement ring features milgrain work along the edge of the band and the stone setting. Milgrain is a row of tiny beads or hemispheres along the edge or boundary of a section of jewelry, which adds a lot of dimension to a piece. The combination of white and black diamonds really makes the black diamond pop. There is a total of 1.25 carats of diamonds on this piece. The band is 14k white gold. Although the center ring isn’t a diamond, it’s still worth a spot on our list. Blue topaz is the December birthstone, making this gem a great choice for people with December birthdays. This ring is made in the USA and features 18k white gold and a round blue topaz centerpiece with a diamond bezel. For those who like simple elegance, this round diamond in 14K gold has no frills but is in no shortage of sparkle. 4 round brilliants are set down the side of the upper shank, and that's it. See simple and elegant. The band of this ring can be done in yellow, white, or rose gold. This ring makes a big impression without the big price tag. 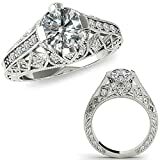 This brilliant cut center stone is sure to shine and be the center of the show while the graceful, twisting band set with 10 smaller round diamonds creates a wonderful foundation for this ring to sit on. The band comes in 14k yellow, rose, or white gold. 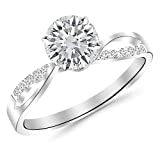 Round diamond rings will always be classic and they won’t be going out of style any time soon. The Twisting Infinity Gold & Diamond Split Shank Pavé is our favorite from this list. The twisting infinity band is gorgeous and with the beautiful round diamond sitting in the middle it is a true show-stopper.